1388 Hates-To-Get-Up-Early, a Native American Shawnee & drummer, opens music store in what will some day become Centerville, Ohio. For five generations the small shop sells mainly bone nose flutes, drums & various other small percussion instruments. 1512 Fleeing the Spanish Inquisition, which he didn’t expect, Feliz Alfonso Manuel de Henriques arrives in the new world planning to open his own guitar shop. Instead, he purchases an existing shop from a decendant of Hates-To-Get-Up-Early named Dude-Who-Shreds, who is retiring to Florida with his Seminole wife, and names the shop “Guitars & Stuff”. 1565 The Henriques family decides to sell only guitars. 1607 English colony at Jamestown runs out of high E strings. The Henriques family ships strings by Passenger Pigeon. 1670 French explorer Tony “Big Chicken” LaSalle discovers the Ohio River, but neglects to bring extra flatwound bass strings. The Henriques family again saves the day. 1704 Luigi Vercotti acquires “Guitars & Stuff” in a game of five card draw. 1751 While exploring Ohio, Christopher “Nigel” Gist purchases a 7-string acoustic & Mel Bay Book 1 from Guitars & Stuff. 1777 Guitars & Stuff Christopher "Nigel" Gist decides to celebrate the year by teaming up with Vasco de Vai to create a series of custom 7 string guitars. Sadly, they are all confiscated by General George Washington to support the war effort. 1794 Guitars & Stuff changes name to “Centerville Music” & closes briefly to avoid “Mad” Anthony Wayne, who always used a metal pick & wore a large belt buckle. 1842 The Wyandots, the last Indian tribe in Ohio, buy guitars at Centerville Music, then split for the coast. 1870 Dr. B. F. Goodrich manufactures the first durable elastic hose, making it possible for Centerville Music to sell talk boxes. 1888 Centerville Music purchased by Ebeneezer Coy. 1913 Invention of formica allows for the production of Danelectro guitars, the easy to wipe clean guitar. Proves popular after flood. 1917 Centerville Music, in a bold move, decides to reissue the 1777 seven string guitar, but they are quickly confiscated by Eddie Rickenbacker to be used against the French in the war effort. 1929 Centerville Music sells first electric guitar, a Gibson Custom Shop ‘59 Les Paul Reissue. 1938 Everitt Hull, inventor of the Motorized Bass on Wheels, ships first production model to Centerville Music. 1939 In a side note-Poland is invaded by Germany, the first waves attacking with, wait for it... motorized basses on wheels. 1941 Centerville Music becomes an Oahu dealer. 1950 The Russians detonate their first Westone-Trevor Rabin protests. 1957 Faced with the choice of a brand new Fender Strat or a Kay Barney Kessel Model, Buddy Holly, sadly, makes the wrong choice. 1962 Centerville Music puts on a Zim-Gar clinic featuring Ishitaro “Honorable Finger” Taragawa. The next clinic will not occur for over 30 years. 1972 Centerville Music forgets to open for almost three months due to new Zappa album. Far out. 1980 Centerville Music sells over 500 Electra MPC guitars. 1986 The "Monkey Grip Wars" wars begin. 1987 All Monkey Grip guitars are confiscated by Steve Vai to be used in the war effort. Sadly, the war ends before it begins. 1988 Centerville Music now managed by Tim & Carol Coy. Flanagan stops by with some cigarettes. 1993 Snakeskin Westones. Need I say more? 1995 Paul Gilbert eats pizza with a fork. 1996 Schick invents a triple blade razor causing Mesa Boogie to invent a triple rectifier amp. This is quickly followed by Gillette's 17 blade razor and Boogie's squadjetuple-rectified 6000 watt all tube head, Warm. 1997 The Foo Fighters confiscate all Mesa-Boogie Squadjrtuble-rectified heads for use in their quest for the ultimate in soul-less guitar tone. 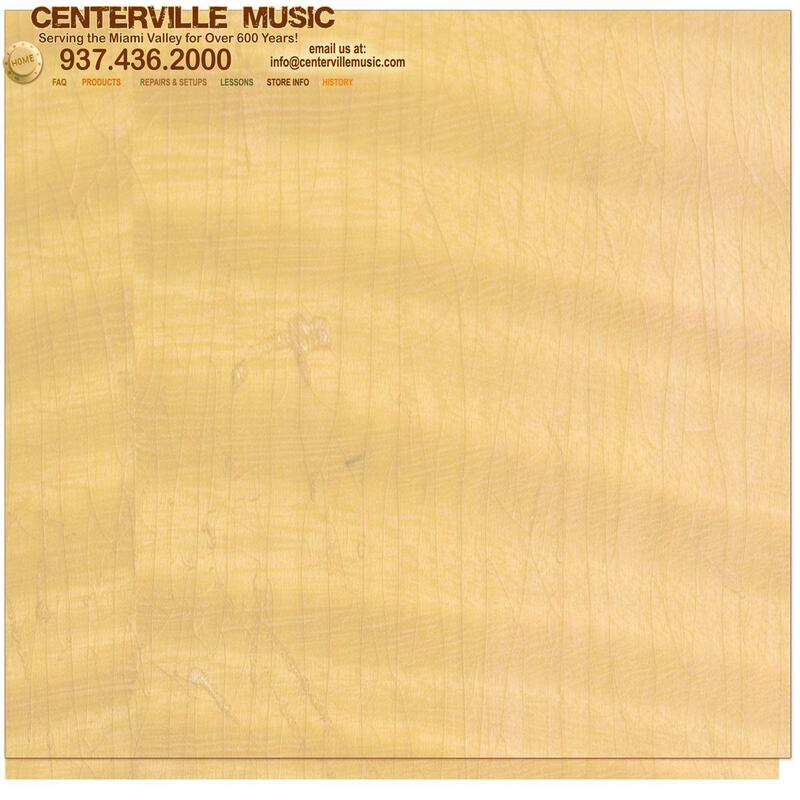 2000 Centerville Music moves to current location in the middle of the night, one step ahead of the law.